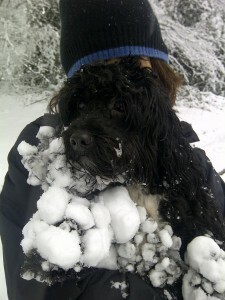 My relationship with snow used to be a reasonably good one. That is until a holiday to South Africa with friends – a year in the planning – was cancelled due to the tremendous snowfall in December 2010/11. 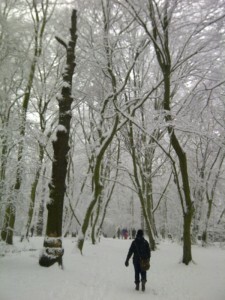 However, yesterday you couldn’t help but be moved by the almost untouched beauty of Highgate Woods in the early morning. Particularly on the back of a visit to the fantastic Hockney exhibition, ‘A Bigger Picture,’ the day before. See more here. As a result, my perception of landscape has been altered. But I very much doubt that our dog cared about the Narnia-esque look of the Woods. He just loves the snow. Leaping and burrowing himself in it, he managed to get one ear and all four paws stuck with ice balls. After weeks of deliberation I’ve finally decided to embrace the world of cyber conversation. The aim of this blog will be to share anything that I deem relevant to work, with a little of the personal thrown in. Bear with me while I jazz up the blog. Fortunately I have the support of a very patient in-house technical advisor who happens to be my youngest son, N.